2. Mme Diomandé wants Djeneba to go to the market. To buy food for preparing lunch. 3. Djeneba needed to buy fish, rice, tomato, bread, vegetable, lemon, onion, tomato paste. 4. And the end of the story, the door bell rings. 5. Judging from the title of the story, Djeneba forgot to tell her mom that she invited a guest for lunch. Activity 2 – Vrai ou faux? Mme Diomandé offer more food to Aminata? – Encore du pain? Aminata refuse the offer? – Non, merci. Je n’ai plus faim. Mme Diomandé ask Djeneba to do the shopping? – Tu me fais le marché? Djeneba agree to do what Mme Diomandé asks? – Volontiers! Ma mère fait souvent les courses dans ma famille. Mais quelquefois mon père fait les course. Nous faisons les courses au supermarché près de notre maison. I’m going to use United Kingdom and South Africa, as examples of a comparison between a MEDC and a NIC. Which is more economically developed country and newly industrialised country. First, let’s compare in terms of life expectancy, and GDP per capita. You can see that through the past sixty years, Britain has steadily, slowly and gradually became healthier and wealthier. Because the dot’s form a trend, increasing both GDP, and life expectancy. Whereas South Africa, increased life expectancy massively, and then decreased and increased again. And stayed pretty much the same on the GDP scale. So in the past sixty years, South Africa’s health has waved up and down up unsteadily and wealth didn’t change much. But Britain’s data shows that British people progressively live longer. To conclude, we can see that a MEDC like the United Kingdom increases steadily and gradually. But on the hand, a NIC like South Africa, which is currently industrialising, progresses unsteadily, and wavy. Now let’s compare the total fertility, which is the number of children born by woman, and the infant mortality, which is the number of children that make it past 2 – 3 years old. South Africa has massively decreased the total fertility, and also decreased infant mortality a little. Thus we can infer that South Africa is gradually trying to improve family planning. Such as improving birth control. Because the dramatic decrease in fertility rate indicates that less children are born. But the slight decrease in infant mortality shows that South Africa can maybe also improve on health care for babies, because that data implies that less children are making over 2 – 3 years old. Unlike South Africa, the UK has only decreased the total fertility a little bit. But it has decreased infant mortality a whole lot. This can tell us that the number of babies that die before the age of three, has increased hugely. Some factors that could cause poor conditions for babies, such as multiple birth are more likely to have a low birth weight, compared to single babies. Also mother that smoke are quite commonly seen in Britain, which can lead to poor condition for birth. Now let’s compare the total energy produced, and the population growth. First, the UK’s total energy production increased significantly, then it hit a huge down fall, but there was no massive jumps between dots, and it was mostly going on a trend. And the population growth kind of stayed the same. This shows that Britain is more industrialised, because of the head start during the industrial revolution. Because there was enough energy to support the population. In 2000, the UK government decide they want to decrease the CO2 emission, by constraining energy policy. That’s why it hit a down fall. In contrast to Britain, the currently industrialising South Africa needs more energy, as you can see, it is slowly increasing, slowing industrialising. And the population changes inconsistently, but it decreased incredibly in 2001. This indicates that the newly rising and industrialising countries are very unstable, compared to the MEDCs. Especially in terms of health. These GapMinder animated data maps can tell us many things about a country. It indicates the trend of a country, thus we may have a prediction of how the country will go in the future. For example, a very developed country like UK, will gradually increase wealth and health. Also, these information can tell you areas of improvement for countries. For example, South Africa’s life expectancy was very unstable. So their government should spend more financial power on improve better medical system and health care. One of the challenges I faced while rock climbing was, well, climbing. The Guide said that we were only using our arms to pull ourselves up. Instead we should also use our feet to push up as well. When we are struggling with one side of obstacle, maybe try with working it out from a different perspective. When I can’t solve a math problem, maybe I can try with a different equation. 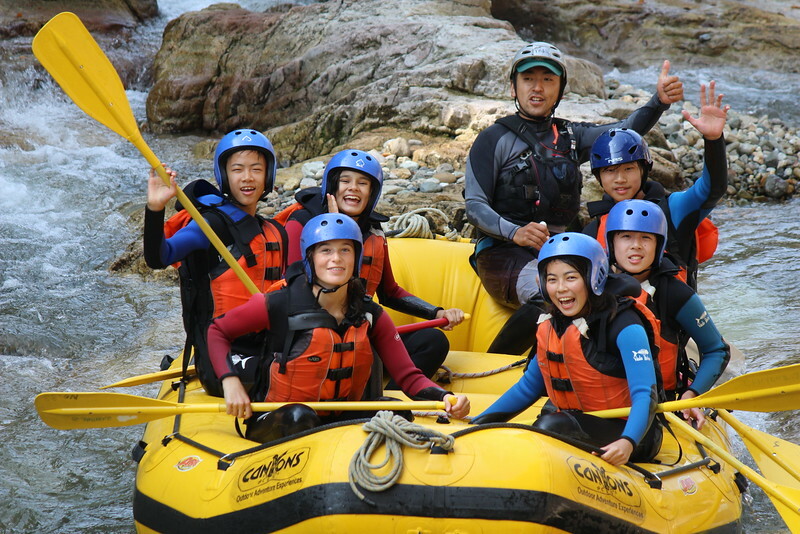 The challenging thing for me when I was rafting was that getting the team to paddle at the same paste. In order to have good teamwork, we must agree on beat. What helped was shouting the rhythm like “1,2,1,2…”, and adjusting if it’s going to fast or slow. And if one person slows down, it drags the whole team down. This lesson could be applied in playing team sports. The team is as good as the worst person, so to bring on the teamwork, we have be on the same level; agree on the beat. When we were doing canyoning, there were a lot of scary high jumps and we had to jump off the the rock. Now I am a person who is very afraid heights. So I really have to image what it’s going to feel like after it’s done, and just taking the leap of faith. Being a risk taker is really going to help me when I’m trying out news things. And one thing I can to to help overcome the fears is to thinks about the feeling about I have completed the challenge. Which is also something very useful that I have learnt during this activity. Overall, I think our elevator scene went quite successful. Everyone portrated a vastly different characteristic. But we all interacted with each other, and thought that we displayed our characteristics well. Which is what made this scene interesting and funny. I displayed very extroverted and out- going attitude, to create my character. I as my character initiatively tried to start conversation with other characters in the scene. Which also illustrated my character’s motivation. Because he was a stereotypical extrovert, very out- going and talkative, that why he tried talk with random people he just met in the elevator. This extroverted personality was also shown by his relationship with other character. The extreme comparison to Everest’s character with his introverted personality. I was trying to talk to him, whereas he just hid his face and did not look at me. In addition, I showed status by bending down to talk to Everest and Tessa sometimes while they were sitting on the ground, and standing the up the whole time. This physicality aspect of my character standing up straight, presents a character with slightly higher status. In this unit I learnt how to create a character using aspects of a person such as status, stereotype and motivation. Stay in a character and not breaking it was something that I found a challenging. Maybe I can improve on fully portraying a complete different character, without any part of me.